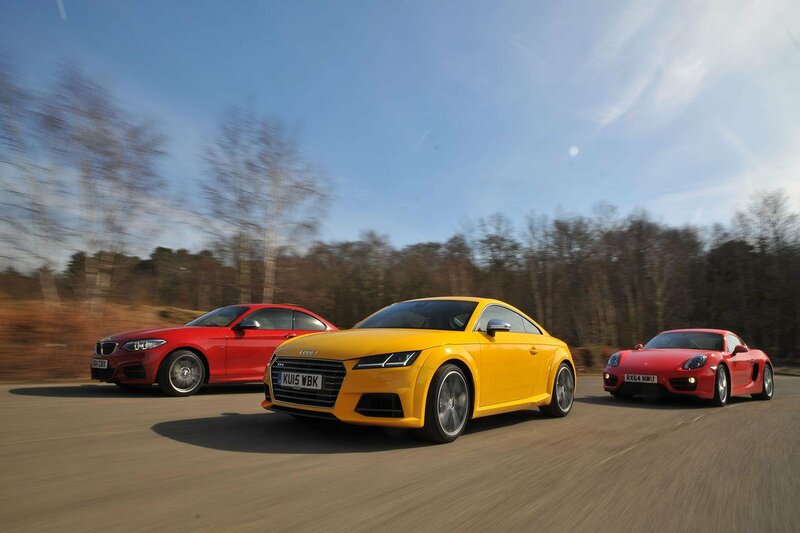 Audi TTS vs BMW M235i vs Porsche Cayman | What Car? A few years ago, getting from 0-60mph in less than five seconds meant buying a proper sports car – a Porsche 911, an Aston Martin Vantage or perhaps even an Audi R8. Now Audi claims to offer that sort of explosive acceleration from its much cheaper TT, and not some big-engined, stripped-out version, either, but from a fairly run-of-the-mill 2.0-litre TTS. However, sports coupés are about more than just going quickly in a straight line, which is why we’ve always been such massive fans of the Porsche Cayman. Even in entry-level 2.7 guise it’s slightly pricier than the TT – and not nearly as well equipped – but few cars in any price bracket handle with such precision and poise. The new TTS also faces tough competition from the cheaper and similarly practical BMW M235i. Its 3.0-litre turbocharged engine kicks out even more power than the Audi’s, making it appear something of a performance bargain. New high-performance version of Audi’s style icon has the power to embarrass some big-hitters. Packs more power than its rivals and costs thousands less. The ultimate performance bargain? The most expensive and the least practical. Few cars in any price bracket are as good to drive, though. If you get your kicks from blasting away from the traffic lights you’re unlikely to be blown away by the Porsche. With 271bhp, it’s the least powerful of the three by some margin, and because its engine isn’t turbocharged it only really starts to deliver its performance when you rev it beyond 6500rpm. No such effort is required in the Audi; its four-wheel-drive system digs in and slingshots the TT away from the line in a fuss-free manner its two rear-drive rivals can only dream of. You might find its sheer competence takes away some of the joy of driving a sports car, but it’s impossible not to be impressed by how quickly the TT accelerates, no matter what revs are on the dial. Tipping the scales at more than 1.5 tonnes, the BMW is fairly portly compared with its rivals. However, the 322bhp 3.0-litre turbocharged engine makes amends, rocketing the M235i to 60mph even quicker than the TT. The BMW can’t keep up with its all-wheel-drive rival up to 30mph, but ekes out a small lead soon after. The M235i’s weight does hamper it through corners, though. There’s always a slight delay between you turning the steering wheel and the nose of the car pointing where you want it to go, and unless the road is super-smooth, the fairly pronounced vertical body movements – by sports car standards at least – are unwelcome and ultimately slow you down. The steering also feels rather remote, so while the M235i is fun to drive up to about seven tenths, it doesn’t reward as much as you’d hope when you push it hard. Quick changes of direction are dealt with better by the TT. It takes bends with barely any body lean, gripping harder and staying far more composed than the BMW. The Audi’s steering is also more accurate and gives greater feedback, although you do need to drive the TT pretty hard before it starts to come alive; at a moderate pace along country roads it’s no more fun than the BMW. However, while the M235i is fun but flawed, and the TT ruthlessly capable if a little anodyne, the Cayman manages to combine the best bits of both cars. It will carry as much speed as the Audi through corners, while always feeling lighter and more adjustable. It steers better than both of its rivals, too, which only adds to the joy of every country road excursion, and helps make even relatively mundane journeys pleasurable. A good driving position is important in any car, but it’s even more crucial in something sporty. The Cayman and TT don’t disappoint, with low-slung seats that place you right in the centre of the action, and hold you in place securely through bends. Both cars have well-positioned pedals and gearlevers, too. You sit higher up in the BMW, and its seats aren’t as supportive as its rivals’ – particularly around the shoulder area. Its pedals are also offset too far to the right, which forces the driver to sit at an awkward angle. The Audi and Porsche also outclass the BMW when it comes to interior quality, with top-grade materials and stunning attention to detail everywhere you look. The M235i’s cabin is smart enough, but barely any more special to look at, or to touch, than that of an entry-level 1 Series hatchback. Practicality is rarely top of the wish list for coupé buyers, which is just as well for the Cayman because there’s room for only two. That said, the rear seats in TT aren’t suitable for anyone other than small kids, and even the BMW’s aren’t fit for adults. However, they both provide a useful place to throw bags, jackets and other bits and bobs. The Porsche also has the least practical boot because, although it officially has the most luggage space when you combine the capacities of its two load bays, neither area is big enough for a large suitcase. What’s more, because the Cayman doesn’t have any rear seats, you can’t extend the load bay to carry bulky items. This is where the TT really shines because its rear seatbacks split 50:50 and lie flat, while the large hatchback opening allows you to load surprisingly bulky items. Split-folding rear seats are also standard on the BMW. However, the small saloon opening prevents you loading anything tall or bulky. The BMW appears to be the bargain here because it’s the cheapest to start with and is available with the biggest discounts. You’ll part with an extra £5055 to buy the Audi and a further £1490 for the Porsche. Of course, the price you pay the dealer is only part of the story, and the savings you’ll make buying the M235i, rather than the Audi, will be wiped out by the BMW’s heavier depreciation. All things considered, the two cars will cost you almost exactly the same to own if you decide to sell after three years. The Porsche is predicted to hold its value better than the BMW, if not quite as well as the Audi, but it’ll still cost you the most to own over three years by some £4500. That’s assuming you don’t choose any optional extras, which you almost certainly will because the Cayman doesn’t even come with Bluetooth, let alone automatic lights or xenon headlights. If you want to spec up your Porsche to the same level as the TT you’ll pay more than £45k. Not that the TT is particularly lavishly equipped; you’ll still want to add the Technology package (£1795) which brings online sat-nav, plus the Comfort and Sound pack (£1320) which adds rear parking sensors, climate control and a punchier Bang & Olufsen sound system. Meanwhile, the BMW gets climate control and reversing sensors as standard, while sat-nav costs a fairly reasonable £595. If you’re a company car driver, the Audi’s relatively low CO2 emissions make it the cheapest of the three to tax by £12 a month over the BMW, and a whopping £100 over the Porsche. The Porsche simply has to win. As soon as you get behind the wheel you’ll forget the facts that it’s the most expensive to buy and run, the least practical, the slowest to accelerate and has the least kit. That’s because Cayman’s sensational handling and tuneful engine will have you grinning from ear to ear – and that’s what sports cars are all about, after all. Having said all that, we could certainly see why you’d be swayed by the TTS’s more brutal performance, better practicality and lower ownership costs – no matter if you’re a private buyer or a company car driver. It’s just a pity that the Audi doesn’t involve you a little more in the action, and that its heavily turbocharged four-cylinder engine sounds a little bit plain in the company of these six-cylinder rivals. It’s also worth noting that most of the TT’s virtues, with the notable exception of its neck-snapping acceleration, remain undimmed in the cheaper, lighter and slightly more fun 228bhp model. The BMW comes third; a placing that seems harsh on what, in many respects, is a very fine car. If your priorities are straight-line pace, cruising refinement and a comfortable ride we’d have no hesitation in pointing you in the direction of the M235i. However, in the company of these bespoke sports cars, the BMW too easily betrays its hatchback roots, leaning more heavily through corners and bouncing around more along undulating roads. It’s also a shame it doesn’t steer more sweetly.